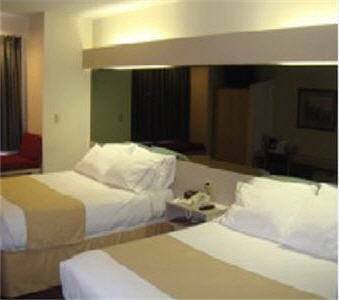 Relax at the consistently enjoyable Microtel Inn and Suites by Wyndham BWI Airport Baltimore hotel conveniently located off the Interstate 295 Beltway minutes from Baltimore Washington International Airport. This lodging is near Baltimore Inner Harbor with Orioles games at Camden Yards and the Babe Ruth Birthplace and Museum. Walk to many restaurants including Chilis and Ruby Tuesdays. Ideal for business and leisure, enjoy modern amenities at affordable rates at this lodging with a complimentary airport shuttle service, easy access to public transportation, complimentary continental breakfast, complimentary wireless Internet access, fitness center and large-vehicle parking. Book your next event in the meeting space, and take advantage of the business center with copy, print and fax services. Guest room amenities include desk, hairdryer and TV. Suites, smoke-free and handicapped-accessible rooms are also available. There is no charge for children 17 and under with an adult.